In the first distance race after the Tour de Ski, it remained to be seen whether Norway’s Therese Johaug, undefeated in distance events, would be able to pick up where she left off in December. As Johaug sat out the TdS, her teammate Ingvild Flugstad Østberg entered the 10-kilometer interval start classic race with momentum, having taken the win in four distance stages of the Tour, including two 10 k classic victories. Østberg also posted the fastest time of the day on the 9 k hill climb to the top Alpe Cermis, a feat that could benefit her on the course in Otepää, Estonia which featured two brutal climbs in each 5 k lap. Appearing at the 2 k and 7 k mark, the largest uphill of the course pushed the limits of the climbing distance allowed in a FIS homologated course. It was too steep for skiers to remain in the track, forcing them into an energy sapping herringbone for the 400-meters toward the top. Adding to the challenge of the terrain were tricky waxing conditions, as light blowing snow fell throughout the race. Known as a classic specialist, Krista Pärmäkoski of Finland was another favorite for the win. 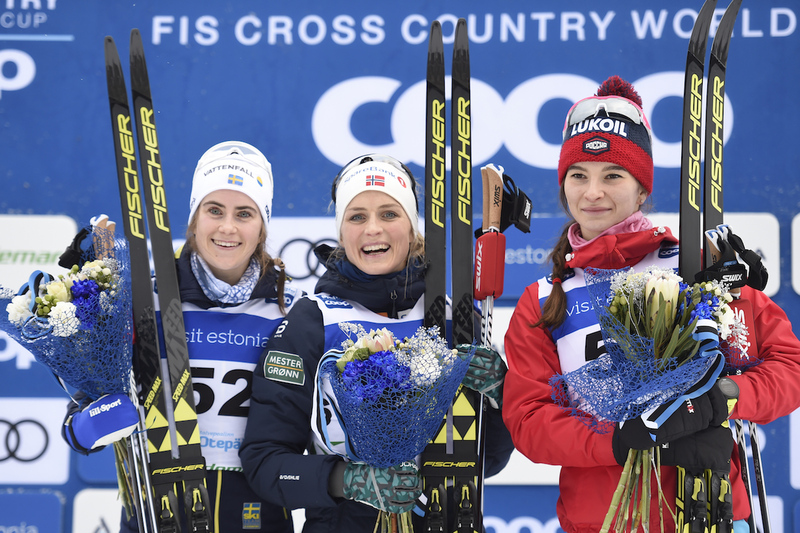 Last season, the Finn won three World Cup 10 k classic races during the season making her, according to an FIS press release, the only woman to win multiple 10 k classic events. As skiers entered the course, Pärmäkoski, who started in bib 30, raced conservatively in her first lap, then progressively set the bar higher at each checkpoint. In the second half of the race, Pärmäkoski’s pace reserved her the leader’s chair where she watched the remaining skiers fight for her coveted spot. Sweden’s Charlotte Kalla made an early push for the podium, skiing faster than Pärmäkoski in the first 5 k, but fell back in her second lap. Likewise, Østberg and her teammate Astrid Jacobsen, bested the Finn in the first half, falling behind in the second. However, three skiers starting behind the Finn wearing bibs in the 50’s were able to best Pärmäkoski, one in her usual supremely dominant fashion. As Johaug attacked the long climbs, powering her way seamlessly through the course with an unmatched tempo, it became clear that the break from racing has not slowed the distance champion. While Natalia Nepryeava of Russia and Ebba Andersson of Sweden, who started one and two minutes ahead of Johaug, respectively, were knocking down Pärmäkoski’s splits at each checkpoint, the Norwegian was chasing fiercely, gaining steadily on the other skiers. 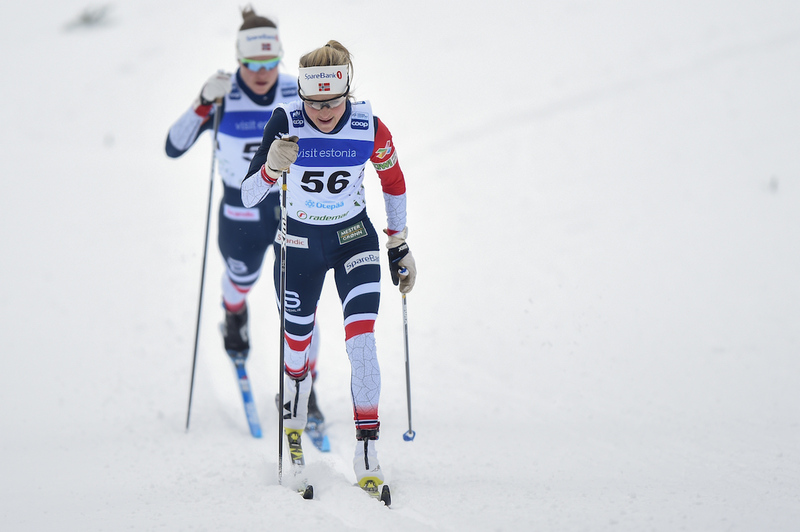 As Johaug double poled powerfully to the finish, reeling in Nepryeava, her victory was indisputable. The Norwegian ran away with the win with a time of 29:53.7, crossing the line 48.4 seconds faster than second place Andersson, and 56.7 seconds ahead of third place Nepryeava. Pärmäkoski ended the day in fourth (+1:14.0), followed closely by Østberg in fifth (+1:14.8), Kalla in sixth (+1:19.9), and Jacobsen in seventh (+1:26.5). On the American side, Jessie Diggins posted the best result with 13th (+2:26.0). Rosie Brennan (APU) finished next in 27th (+3:09.9), followed by Sadie Bjornsen in 29th (+3:11.3), Caitlin Patterson (CGRP) in 39th (+3:50.9), and Ida Sargent (CGRP) in 41st (+4:17.2). Diggins, who finished in sixth place in the Tour de Ski, now sits also in sixth place in the overall standings. Most often thought of as a skate specialist, Diggins has earned three top ten finishes in distance skate races outside of the TdS this season. However, she has steadily improved as a classic skier in the past few seasons and also cracked the top ten this year in the Val di Fiemme 10 k classic race. After racing as a discretionary pick in Period 1, Brennan declined her spots in the Tour de Ski and headed back across the pond. Because of her strong results in Period 1, Brennan was offered Period 3 starts as well. She returned to Europe for the races in Otepää and Ulricehamn, Sweden in hopes of qualifying for the World Championships in Seefeld, Austria. After today’s finish, Brennan is ranked 22nd in the overall distance World Cup standings. Dahria Beatty, the only Canadian to enter Sunday’s 10 k, finished 43rd (+4:42.5).